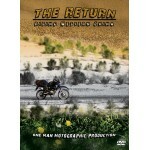 Adventure Motorcycle related DVDs and books. After a brush with death and stupidity in 2005, “The Return” takes us back in 2006 on a solo ride from Sichuan, China through Tibet-Qinghai then into Xinjiang - home of the great Taklamakan desert and the Karakoram Highway leading us to our ultimate destination - Kashmir. All on 150cc bikes. Produced entirely by one man using simple video and still cameras; Carl Parker shares the story of these two adventures using photos, video, artwork, and music from Proximity Butterfly. Wanna go for a ride?